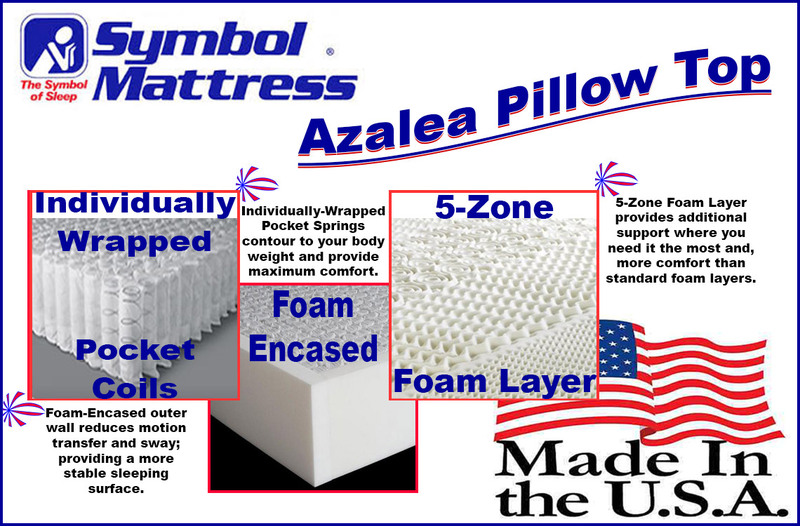 The "Azalea Pillow Top" is a fantastic balance between comfort and support which contours to the body but has a sturdy, dependable feel to it. 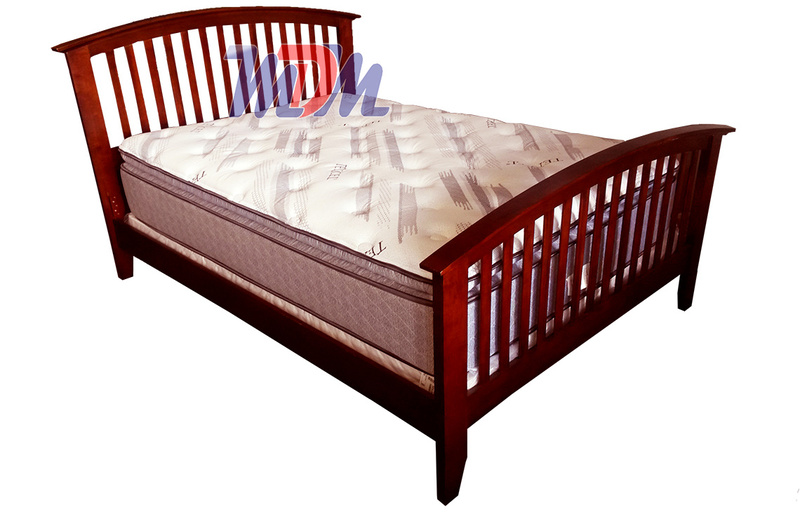 It has a very low cost - in comparison to any mattress in the industry that has even a similar build. 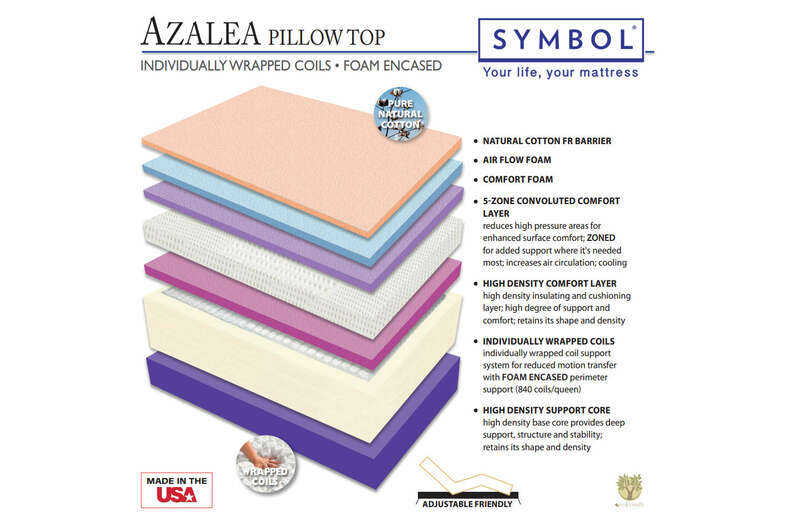 The cover of the Azalea Pillow Top is Pure Natural Cotton; something that is rare to see in a moderately priced mattress. And - despite its High Density Support Core - it's adjustable-friendly so you can enjoy this mattress's many benefits on an adjustable bed! 840 Individually-Wrapped "Pocket Coils" seems to be just the right number that indicates lower-gauge (thicker) metal and comfort level. It's a tough balance but Symbol Mattress seems to have nailed it. 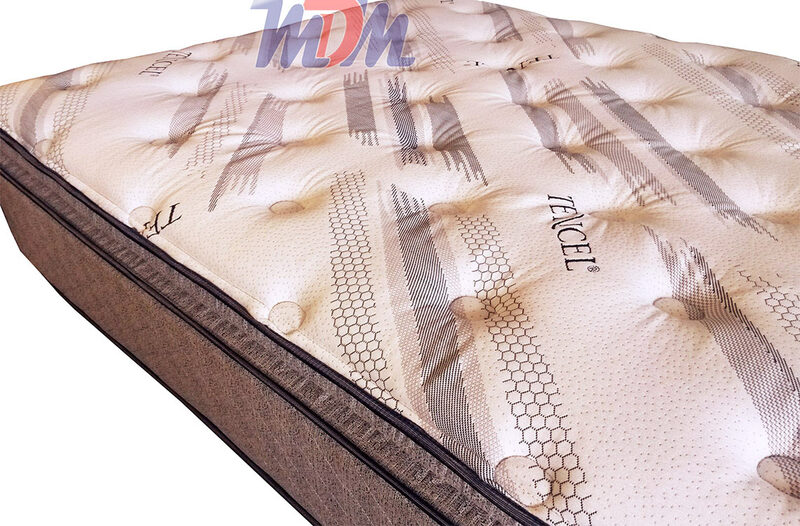 The pillow top on this model does precisely what a pillow top should do; give to you an additional, lofty top of the mattress that helps you to fall into a deep sleep - without causing you to wake with back pains because the bed is letting you fall too deeply into it. 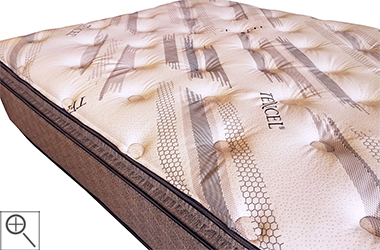 Zoned Convoluted Foam reduces high pressure areas for enhanced surface comfort. The zoning gives added support where it is needed most and it also increases air circulation and cooling. Pardon my expression but, this is one h*ll of a great-feeling mattress! I'm normally on the firmer side of the spectrum when it comes to my personal preference in sleeping comfort but this Azalea provides as much support as its firm counterpart but has just enough cushioning in that extra pillow top layer to provide a place that you just want to lounge and perhaps type away on your laptop, or binge watch Netflix. Symbol Mattress keeps impressing me, time after time, with their ability to provide high-quality mattresses, with cutting edge technology, for an almost ridiculously low price!